In the dairies of fashion, Vogue has its own name and fame. This October, Vogue India finishes 11 successful years in the world of fashion and lifestyle. Vogue has worked so well in these past years that it is now a brand. And to celebrate this occasion they took a step of bringing the country’s most influential women and men together. Vogue is all set with it’s the second edition of awards named the Vogue Women Of The Year 2018 Awards, almost the entire Bollywood was present for the award night. Venue decided for the celebration was Grand Hyatt Hotel in Mumbai. Though glitter and metallic was not the theme almost all the divas were dressed in those. Scroll to our gallery to know who all were there in the event. 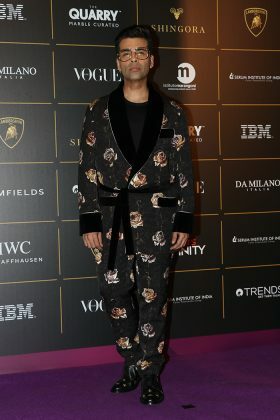 Karan Johar the host of the evening was dressed in Dolce & Gabbana suit and Gucci. Alia Bhatt selected a semi-sheered dress by Roberto Cavalli collection at awards. Ishaan Khatter selected the dapper by Sahil Aneja and footwear by Steve Madden. Kareena Kapoor Khan selected a deep neck dress and dazzles her looks in Naeem Khan. Black never fails, and Preity Zinta nailed her look by Caroline Bibawi dress. Karisma Kapoor selected a shining silver dress by Julien MacDonald designer wardrobe. Kiara Advani was seen dressed in metallic number by in Nikita Tandon. Maria Grazia Chiuri, creative director, Christian Dior Couture wore her signature pantsuit in all-white. 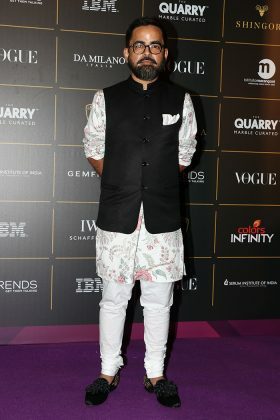 Following people were rewarded with a special trophy, Anamika Khanna: Vogue Designer Of The Year, Meghna Gulzar: Vogue Filmmaker Of The Year, Radhika Apte: Vogue Trends Disruptor Of The Year (Female), Kareena Kapoor Khan: Vogue and IWC Schaffhausen Style Icon Of The Year, Ayushmann Khurrana: Vogue Man Of The Moment, Ranbir Kapoor: Vogue Man Of The Year, Alia Bhatt: Vogue and Lamborghini Youth Icon Of The Year. Maria Grazia Chiuri, Vogue Global Icon Of The Year. Previous articleTaylor Hill, And How She Gets Those Brows You Envy! Next articlePaint and Firm Your Skin This Season With Glam Glow!